i'm trying to develop a server-client application with EJB and a swing-client. please, is there anyone to help me? From the behaviour it look like that your jndi.properties are not used. 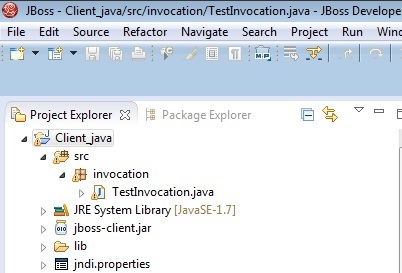 javax.naming.NameNotFoundException: SGMpack_EJB_Project/IApplication!sgmpack.ejb.application.Interfaces.IApplication -- service jboss.naming.context.java.jboss.exported.SGMpack_EJB_Project. "IApplication!sgmpack.ejb.application.Interfaces.IApplication"
Your problems are a lot deeper than JNDI issues. You cannot create server-side Swing components and render them in any kind of client application, remote or local. That does not change the fact that what you are trying to do cannot and will not work. well you are right, that didn't resolve my problem. i created a java project and tried to use it as my client. 1- what does this warning mean? i placed my jndi.properties file under the source package. now my code seem to "see" it. and i get the same errors as when i insert the parameters in the code. Please have a look at http://www.jboss.org/jdf/quickstarts/jboss-as-quickstart/ejb-remote/ and get that working. After that, try to build up your Swing client using the client code above as a start. DO NOT USE ANY SWING OR AWT COMPONENTS IN THE SERVER SIDE (EJB) CODE. It will not work!